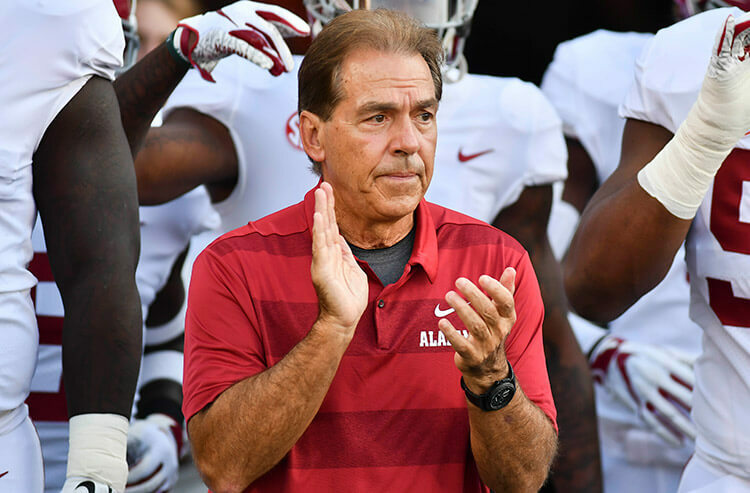 Nick Saban's unbeaten Alabama squad is a big favorite Saturday night at LSU and is getting plenty of support, particularly on parlays. But the home underdog Tigers are drawing steady public play. It’s a solid Saturday of college football, with several appealing matchups, none bigger than a battle on the Bayou tonight. Covers checks in on the action and line movement for a handful of Week 10 games, with insights from John Murray, director of The SuperBook at Westgate; Nick Bogdanovich, director of trading for William Hill US; and Scott Shelton, sportsbook supervisor at The Mirage on the Vegas Strip. Alabama is again a monster favorite, even though a top-five team awaits in a night game at Death Valley. 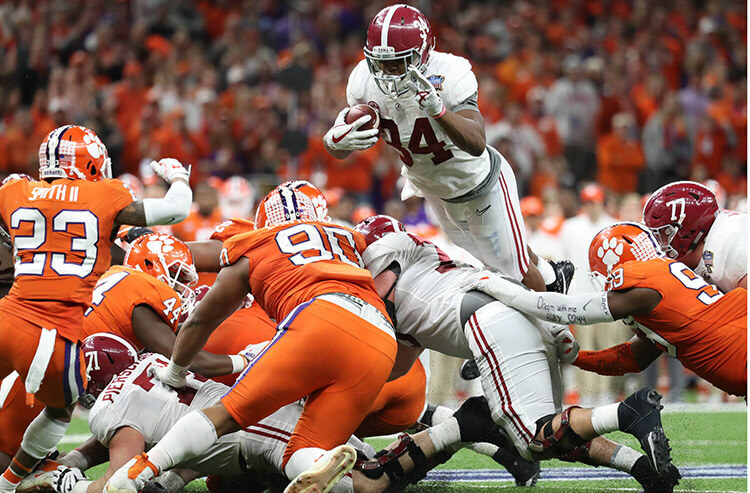 The Crimson Tide (8-0 SU, 5-3 ATS) haven’t had a result closer than three touchdowns, including a 58-21 pummeling of Tennessee as 29.5-point road favorites in Week 8, before a bye last week. Louisiana State is also coming off a bye and hoping to keep itself firmly in the College Football Playoff conversation. The Tigers (7-1 SU, 5-3 ATS) fell at Florida in Week 6, rebounded with a home upset of Georgia in Week 7, then topped Mississippi State 19-3 as 5-point home faves in Week 8. Bogdanovich sang a similar tune at William Hill US, where ‘Bama opened -14 and ticked up to -14.5 midweek. Georgia, which reached the CFP championship game last season before losing to Alabama, aims to stay in the playoff picture in another key Southeastern Conference game. The Bulldogs (7-1 SU, 4-4 ATS) bounced back from an upset loss to LSU by beating Florida 36-17 laying 7 points last week, in a neutral-site contest in Jacksonville. Kentucky will get an opportunity to prove it’s the real deal in this 3:30 p.m. ET kickoff. The Wildcats (7-1 SU, 4-4 ATS) narrowly dodged defeat last week, getting a TD on the game’s final play for a 15-14 victory at Missouri catching 7.5 points. “Same scenario as Alabama-LSU, dead even, and all the parlays are to Georgia,” Bogdanovich said, noting he expects William Hill US to need the home ‘dog. The SuperBook also opened Georgia -9.5, spent most of the week at 9 and dipped to 8.5 Friday night. Michigan fell at Notre Dame in Week 1, but hasn’t lost a game since then. The Wolverines (7-1 SU, 5-3 ATS) had a bye in Week 9, after besting Michigan State 21-7 laying 7.5 points on the road in Week 8. Penn State dropped two big games at home that it could’ve won, against Ohio State and Michigan State, then got back on track with a couple of close victories. In Week 9, the Nittany Lions (6-2 SU, 5-3 ATS) held off Iowa 30-24 as 5.5-point home favorites. The SuperBook opened Michigan -10 and reached 12.5 before ticking back to 12. Notre Dame brings its perfect record and CFP hopes into this 7:15 p.m. ET clash. 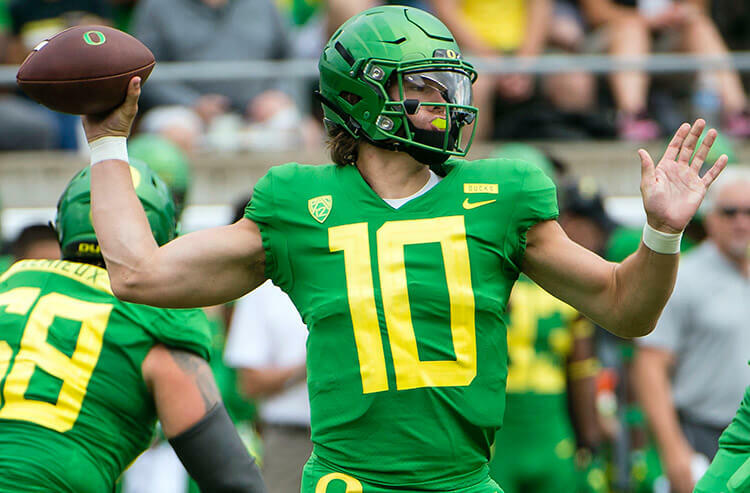 The Fighting Irish (8-0 SU, 5-3 ATS) plowed past Navy 44-22 in Week 9, narrowly cashing as 21.5-point faves in a neutral-site game in San Diego. Northwestern is on a four-game winning streak, after losing three in a row. In Week 9, the Wildcats (5-3 SU, 4-3-1 ATS) built a 31-10 lead against visiting Wisconsin and coasted to a 31-17 victory as 3.5-point home pups. William Hill US opened Notre Dame -8 and was up to -10 by Thursday afternoon. “Straight bets are dead even, but the parlays, teasers and moneyline parlays are all to Notre Dame,” Bogdanovich said. 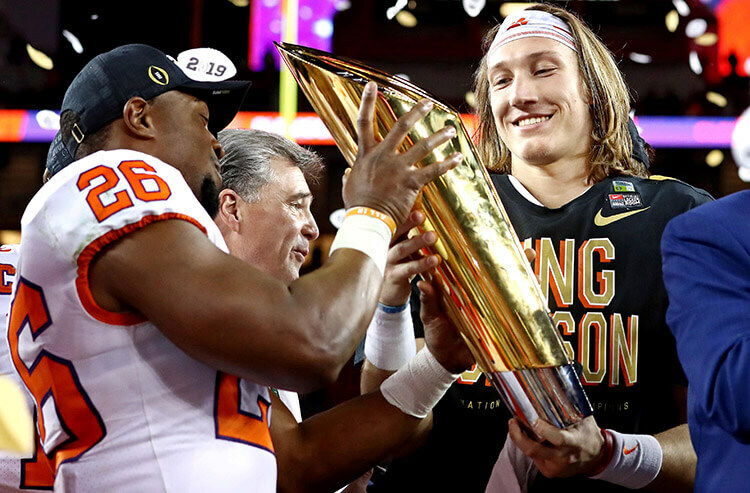 This matchup would normally be a footnote, except that unbeaten Clemson is creating large liability for The Mirage and other MGM Resorts sportsbooks. The Tigers (8-0 SU, 4-4 ATS) enter this noon ET meeting after a 59-10 boatracing of Florida State as 18-point road favorites last week. Louisville is finding the terrain quite rough in the post-Lamar Jackson era. The star quarterback moved on to the NFL after last season, and the Cardinals are a dismal 2-6 SU and 1-7 ATS. Louisville went off as 2.5-point home chalk to Wake Forest last week and lost 56-35. The Duffel Bag Bettor has the Tigers on two parlays: a $50,000 two-teamer of Clemson (-39) and Toledo (-19.5), already halfway in after the Rockets easily covered Wednesday against Ball State; and a $20,000 three-teamer of Toledo, Clemson (-39) and Minnesota laying 9.5 at Illinois. • West Virginia at Texas, 3:30 p.m. ET: “The public definitely is on Texas, ticket count 3/1,” Murray said. “I heard some sharper groups were taking West Virginia. To me, it’s a tossup.” The Longhorns opened -1 at The SuperBook and have spent the past couple of days at -2.